Garmin 740 | Our complete unbiased review of the Garmin 740 chartplotter and more on marine electronics. The Garmin 740 is a multifunction display featuring a high resolution 7-inch display with a touchscreen user interface. An internal high-sensitivity GPS sensor combined with preloaded Garmin BlueChart g2 U.S. Coastal cartography gives detailed position and navigation information. The 740 package ships with the display unit, a protective front panel cover, mounting bracket, power/data cable, owner’s manual, quick reference guide, and installation instructions. The front panel footprint measures approximately 9-inches wide and 5.5-inches high. Overall depth is 3.2-inches. Buy this Garmin chartplotter here. The display unit back panel has four connectors, one each for a power/data cable, NMEA2000 port, radar sensor, and external GPS sensor. The latter uses a metal twist-lock BNC connector while the other three use threaded connectors. The thread-lock connectors are new and I like them for their solid lock and security when compared to the old style plastic twist-locks. 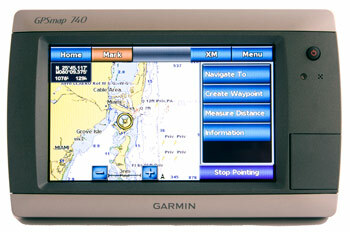 The 740 chartplotter will interface with several Garmin radar units but is not capable of being networked to other MFDs. Officially designated the Garmin GPSMAP 740, this Garmin marine GPS chartplotter is capable of communicating with other devices using a NEMA2000 network. It will also interface with a marine VHF radio, autopilot, as well as other compliant sensors using the NEMA0183 protocol. At the top and bottom of the display face you will find removable bezels that cover mounting holes in the case used for a flush mount. All you’ll need to complete the task of flush mounting the 740 in a helm area panel is cut the hole and fasten the unit in place with the supplied screws. The display has a front panel footprint that measures approximately 9-inches wide and 5.5-inches high. Overall depth is 3.2-inches. The 740 screen has a landscape layout and measures 6-inches wide by 3.7-inches high which yields a 7-inch display screen size when measured on the diagonal. Pixel count is a very high 800 by 480. One of the combination views available is two charts. On the left is the standard 2D view and in the middle the Perspective view. The data box on the right has a wealth of information. I am rating the daytime viewability of the high resolution Garmin display screen as excellent. With its high resolution even fine details are sharp and clearly readable. When viewed using polarized sunglasses I noticed slight darkening of the screen, however it always remained fully readable, even out at severe side angles. No screen fogging was apparent in the display at anytime during our review. The Garmin 740 has two color palettes, day and night, either can be selected manually or the selection can be set to automatic. The night palette uses darker coloration to enhance night viewing. This unit also has an automatic backlight control system that uses a sensor to determine the appropriate backlight level. I tried it and found it worked very well at matching the surrounding light levels. I am rating the 740 excellent for night viewability. This Garmin standalone chartplotter brings down the easy-to-use touchscreen interface first launched on the big expensive Garmin MFDs to a much more affordable machine. Like other Garmin plotters, things get started on the 740 with a Home page display menu. From here you may select Charts, Radar, Weather, Configure, Where To, Information, Combinations, or Information pages. There is also touch field to create a waypoint. I tested this Garmin chartplotter with software version 2.10 installed. Garmin regularly adds features and fixes to chartplotter software. As a unit owner you should occasionally check the website for updates and install them. You will need a blank SD memory card and a card reader for your computer. To create a waypoint at the vessel present position you’d hit the Mark touch field located both on the top line of the chart page and on the home page menu. Once you press it the 740 builds the waypoint and switches you to a waypoint page where you can see the name, position, depth, and bearing and distance information. From this screen you can edit the data, move the waypoint, or delete it completely. There are actually two pages to this screen and if you use the right arrow field at the bottom of the page you will see a mini chart view pop up onscreen showing the location of the waypoint. You can create a waypoint anywhere on the chart page by touching the screen where you want the point and then choosing the create waypoint field. You navigate to a waypoint by selecting it from the chart or the waypoint list. You would follow through with a couple more menu selections to execute navigation to the point. After you execute you will see a course line and numeric data displayed onscreen to provide guidance to the waypoint. The Garmin 740 can store up to 3000 waypoints and 100 routes. Waypoints are identified with a user-defined name up to 10 characters in length and one of 70 symbols. You can also add a comment about each point. Route building in the Garmin GPSMAP 740 is easy to accomplish. Touching your final destination on the chart page followed by a press of the Route To function will get things started. All you have to do now is touch the chart and click the Add Turn field as needed for each added waypoint along the way. Using the man overboard function on the Garmin is a multi-step process. First off, you will need to press the Mark button. Then you will need to cursor to the MOB field and confirm your selection. Once done, the 740 creates a waypoint, switches to the chart view if youre not already on it, and opens data boxes that provide enough navigation information to take you back to the MOB position. As I have said many times before in a variety of chartplotter reviews, a single action MOB function preferred over multi-step procedures like this one. When you search for services or marina information the list generated shows results based on distance. Screen redraws on the Garmin 740 are very fast and smooth. Noticeable map redraws can be seen when zooming out while a zoom in is fairly seamless under most circumstances. Selecting the Where To page from the Home page menu provides the user with locations for services as well as access to tracks and lists of waypoints and routes. You will also find a Stop Navigation function field displayed here. Once function that continues to be missing from this Garmin chartplotters bag of tricks is a Restart Navigation command. This particular function is found on many chartplotters and has proved to be a real benefit to fishermen and cruisers. If you are traveling to a waypoint and need to move off course for some reason having the Restart Navigation function makes heading back toward you selected waypoint from your new boat position really easy. I wish Garmin would consider adding this feature. Tides, current, celestial, user, and other vessel data can all be found via the Information page. Certain other data can be accesses by placing the cursor over the object in question from the chart page. The Garmin 740 is rated waterproof to IPX7 standards, which means it could be submerged to a depth of 1-meter for up to 30 minutes and survive undamaged. The unit carries a 1-year warranty. The Garmin 740 chartplotter shows lots of chart details with its super sharp screen. I found it easy to use too. 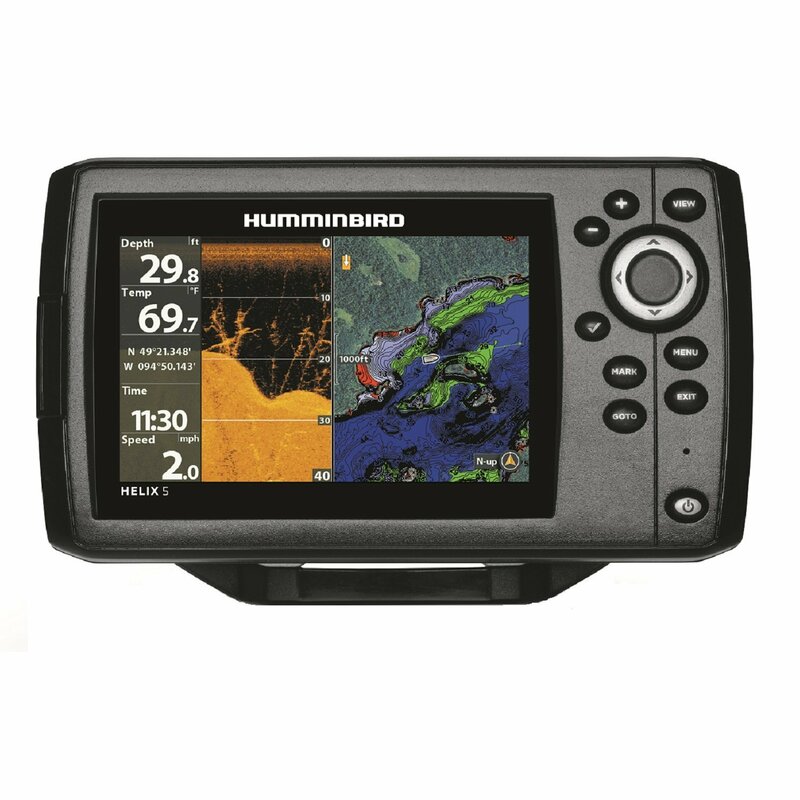 A powerful processor gives this Garmin chartplotter a chart view that moves smoothly as the boat travels or you range the chart.